Our beautiful 3 bedroom detached cottage has been recently restored with the latest contemporary fixtures. New for 2013 is a modern extension to the side of the property which complements the traditional charm of the original building. This makes a large kitchen/diner with bi-fold doors opening the full length of the room overlooking the garden, the pool and the open countryside beyond. The previous kitchen has now been transformed and used as a snug, so somewhere peaceful to sit and relax with a good book. From the terrace enjoy spectacular views of the surrounding countryside which together with the large private pool ensures that you can unwind & relax from the moment you arrive. Appreciate the pleasures of outdoor dining on the terrace with fresh local produce and watch the sunset across the valley. The cottage offers a convenient base close to Riberac to explore picturesque villages and the local countryside of the Dordogne. Take a picnic along the river or sample one of the many great restaurants. For the more sporty - cycling, swimming, canoeing, tennis and horse riding are nearby. Alternatively just take advantage of the peace and tranquility of life at 'Les Volets Verts'. Renamon (approx. 12kms) is situated on the River Dronne. Here you can hire canoes, relax on the small beach and there is a cafe/bar for your refreshments. In the evenings there is often live music. Grand etang de la Jemaye (approx. 22 kms) is a great lake for swimming (overseen by lifeguards) with a sandy beach. Enjoy your own lunch in the picnic area or treat yourself at the cafe. Other activities close to the cottage include horse riding, bicycles for hire, tennis, fishing & there is even a couple of 9 hole golf courses which are pay as you play. Brantome - often described as the 'Venice of Perigord' as it is surrounded on all sides by the river Dronne. Outside Brantome is the Renaissance Chateau de Puyguilhem decorated inside with tapestries. Many other 'things to do' are detailed in our information pack. Dining Out: We have listed in the 'Welcome Handbook' our favourite restaurants from a wide choice & we look forward to you adding to the list with your comments. Most restaurants offer a fixed price menu for 2, 3, 4 or even 5 courses providing great value for money especially at lunchtime which is considered to be the most important meal of the day. Sample the regional delights of south west France - 'foie gras', 'confit' & goats cheese. More locally, walnuts are produced in abundance & are used in everything from salads to desserts. Bathroom 1 - en suite to bedroom 1 upstairs with a contemporary freestanding bath. Bathroom 2 - situated on the ground floor with a large corner shower unit. Towels are provided for the bathrooms & beach towels for the pool. French doors open from the living room onto the main terrace where there is a large BBQ with an outdoor table (seats 8) under the cool of a parasol. Here you can cook the fresh delicacies you have purchased at a local market. This is complimented in the kitchen by an American fridge freezer & a range cooker with 5 rings & a huge oven - but don't worry about the washing up as we have a dishwasher. Our 12 m x 5 m swimming pool with steps leading into it is of equal depth throughout so that you can play games easily, swim lengths or relax and cool down whilst seated on the steps. If you want a change from the pool we have a selection of indoor & outdoor games (including boules! ), flat screen tv with freeview SKY, DVDs and numerous books available for your use during your stay. There is a laundry room with a washing machine, tumble dryer, iron & ironing board. Lovely cottage, nicely extended and well kept. Peaceful location - what a view. We really enjoyed the pool in the hot weather. Stunning house with even more stunning views! Family of four enjoyed a very relaxing week here. We wanted a relaxing 10 day family holiday and that's exactly what we got. The cottage is in a lovely remote and quiet part of Celles, with stunning views, not overlooked and even had the bonus of wildlife (deer, rabbits and hares) the sunsets were also stunning. The cottage had everything we needed and had the nice touch of books, DVD's, music and a selection of games even pool table. The pool was a good size and not to deep and again not overlooked. Even though the cottage is in a remote area, the village of Vertillac wasn't that far away and had a lovely bakery, butchers, bars and restaurants and a store. Then the town had a bigger supermarket and restaurants even a market on a Friday! We would highly recommend this cottage for other people to enjoy!! Thank you Christine for all your support and guidance on the lead up to our holiday and getting in touch when we returned. Good luck to you for the future! The kitchen was huge and very modern compared to the rest of the place. But the modern and old work so well. A beautiful property with stunning views adequately equipped with everything you will need. Spotlessly clean and in a peaceful and tranquil location. 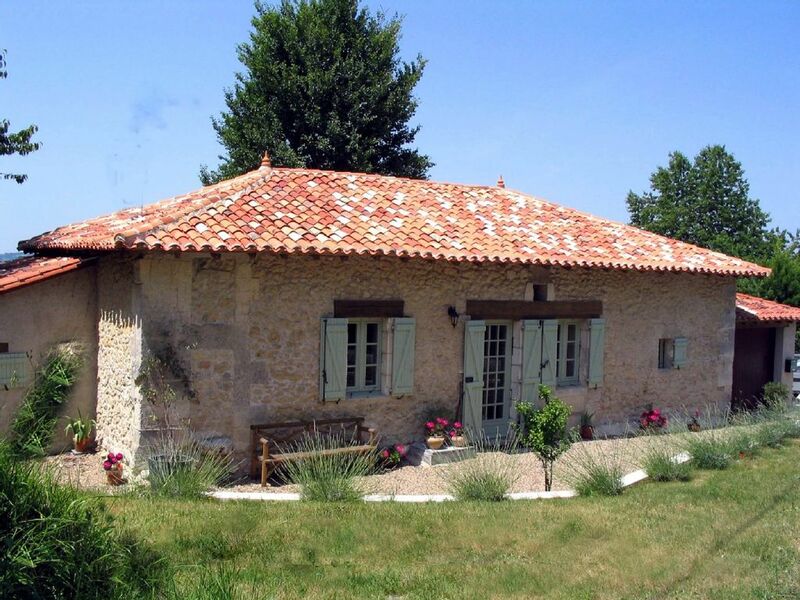 The cottage is situated in the heart of a small hamlet and within walking distance of the local village providing a typically French bar which also sells baguettes! A short 7 minutes drive away is the beautiful village of Verteillac which offers 3 bars, 3 restaurants, 'la boulangerie', newsagents, post office, bank with cash machine, garage, butchers and a general store selling everything from fresh tomatoes to lawnmowers (even open on Sunday mornings). Alternatively, 12 km away is the town of Riberac which is famous for its lively, unmissable Friday morning market & has a wide selection of cafe/bars & restaurants together with 2 large supermarkets. Other Activities: canoeing, horse riding, fishing, swimming, walking. Whilst we welcome children the property is not suitable for the very young & babies.